"Something you keep close to you"
Le Festival au Desert, the Festival of the Desert, is held annually in the oasis of Essakane, featuring traditional Tuareg and celebrated Malian musicians as well as groups from other West African countries. Essakane is located in the Tombouctou region approximately 65 rugged kilometers from the city of Tombouctou. Noted musicians in attendance include Tinariwen, the Tuareg group from Tombouctou that gained international notoriety with their performance during the debut of the festival in 2001. Salif Keita, Oumou Sangare, Habib Koite, the late Ali Farka Toure and his son Vieux Farka Toure are just a few of the shinning stars who delight the multi cultural international audience. The idea for the festival took root in 1996 during a time when 3,000 guns were burned in the “Flame of Peace” to signify the end of fighting between peoples of the region. The idea was to combine the festival with the great traditional gathering of the nomadic Tuareg, or Tamashek people to promote the economy and develop the region. The name Tuareg applies to a Berber ethnic group and originated with the early explorers and historians of the region. The Tuareg call themselves Kel Tamasheq which translates to “Speakers of Tamasheq”. For centuries, traditional gatherings of these nomadic people have been celebrated with song, dance, poetry, ritual sword fighting, games, races and other customary entertainments. For international visitors, the festival offers a wondrous occasion to be immersed in the world of the desert dwelling Tuareg. The three night festival provides a kaleidoscope of smells, sights and sounds that titillate the senses. Daytime activities include sampling delicious traditional food, shopping for treasures at the craft market, listening to impromptu concerts and participating in social interaction with people from local ethnic groups and visitor from around the globe. The feature concerts begin in the evening and the impressive high tech sound system fills the starry nights with enchanting, rhythmic melody until the wee hours of the morning. These Guys Seem Awed by the Crowd! Interested in Horseback Riding in Mali? I’ve organized a few photos taken during my recent travels to Mali so that I can share them with those of you who are intetrested in joining me on horseback treks in this culturally rich and delightful country. The ride currently in the works is in January 2010 and will include the Festival au Desert in Essakane out of Tombouctou. We will ride with the Tuareg and experience their way of life and love of the vast Sahara Dessert. 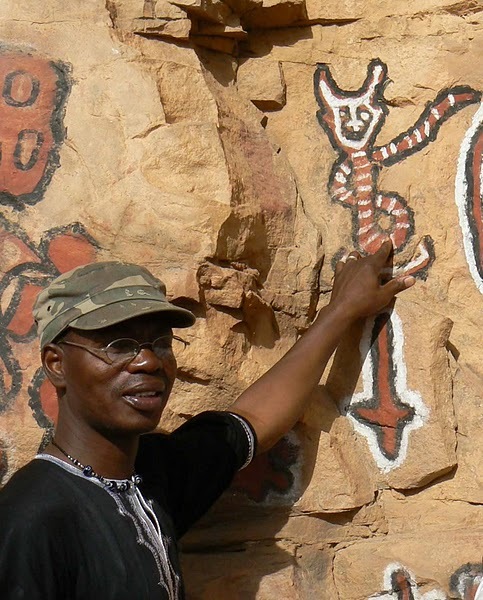 Other Malian riding destinations include Pays Dogon also known as Dogon Country, and Hamdallaye, the Fulani area. All rides and tours are arranged with my Malian partner who is a licenced tour operator: Gorel Sidibeh. The Tombouctou portion of our tours are in alliance with Shindouk M. Lamine ould Najim who is the President of the Association of Guides in Tombouctou. Gorel and Shindouk are partners in their company called Sahara Passion. Please feel free to contact me for details on the Tombouctou ride or with inquiries on additional destinations in Mali at lostinbotswana@yahoo.com. Take Me to Your Leaders! A brief thank you to Sue Wehner, Stephanie Van Reigersberg and Patricia Hills for their participation as “crash test dummies” for our 2009 Pays Dogon ride. Sue and Steph, thanks so much for your wonderful photo contributions! We are fortunate to have been introduced to Oumar in-Dahoye el Arawanie who is a horseman of note, through Shindouk. It is unusual to find a horseman with Oumars talents among the Tuareg in the Tombouctou region, as the camel is the usual Tuareg preference. Ourmar has a passion for horses shared by serious horsemen world wide.